Arts and crafts are fun to have, to look at, and to show off. Many people attend craft shows just to look at all the different items and end up finding artistic treasures they can't resist. Ben and Agnes have had an arts and crafts business called A & B Crafts for over ten years where they make a variety of crafts. 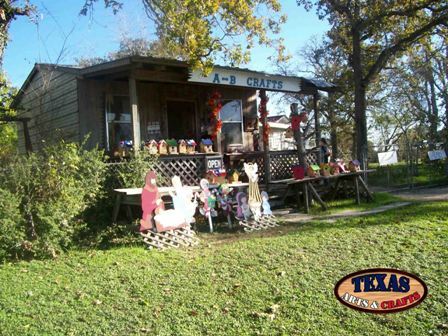 A&B crafts is located in the heart of Texas, five miles south of Schulenburg, on HWY 77 North -- just across the Lavaca county line. Ben is the wood-worker of the team. He has a work shop there where he cuts out and builds the crafts. 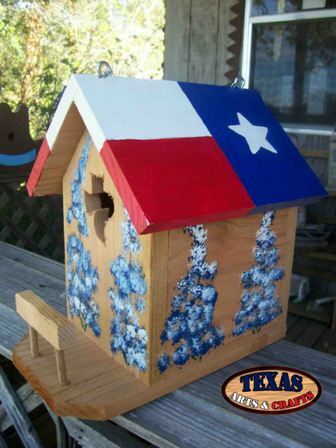 He spends many hours every day making items such as bird houses, bird feeders, seasonal yard art, dog houses, key racks, funny sayings signs, welcome signs, and many other cute and fun items. Agnes is the artist and she does all of the detailed hand painting of the crafts. She also manages the store in Schulenburg where they sell many of their crafts. The types of wood used in making most of their crafts include cedar, pine, and plywood. The crafts that are painted are painted with Kilz House Paint for long lasting durability. Most of the art work is then sealed with an acrylic sealer to preserve the artistic creation from the elements.